Former California Gov. 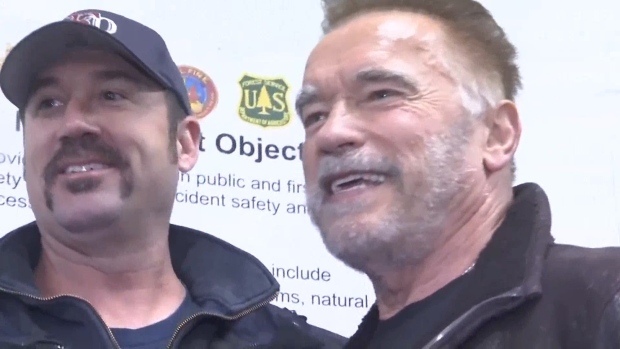 Arnold Schwarzenegger made a surprise visit, telling firefighters, "I wanted to let you know how much I appreciate all the work that you do"
With the first of two rainstorms barreling down searchers are now braving the harshest of conditions to find those missing in the Camp Fire. Jodi Hernandez reports. UPDATE: (6:10 p.m.) Death toll in Camp Fire now at 83 after two more bodies found, Butte County Sheriff's Office says. Officials also say 563 people remain unaccounted for. Light rain falling Wednesday in some areas of Northern California could aid crews fighting a deadly wildfire while raising the risk of flash floods and complicating efforts to recover the remains of those killed. Heavier rain was expected later in the day in the Paradise burn area, where a monstrous wildfire has killed at least 83 people and destroyed more than 13,000 homes. Former California Governor Arnold Schwarzenegger surprised firefighters battling the Camp Fire in Northern California with a visit. Farther south, residents of communities charred by a Los Angeles-area fire stacked sandbags as they prepared for possible downpours that threaten to unleash runoff from hillsides left barren by flames. Forecasters say the rain could cause mudslides and rock slides. In Paradise, teams sifted through ash and debris as they searched for bodies about 140 miles northwest of San Francisco. "The task is arduous," said Rick Crawford with the California Department of Forestry and Fire Protection. "And the possibility exists that some people may never be found." Precipitation could hinder the search by washing away fragmentary remains and turning ash into a thick paste. Former California Gov. Arnold Schwarzenegger made a surprise visit to the area, providing encouragement to weary firefighters while helping serve them breakfast. "I wanted to let you know how much I appreciate all the work that you do," he told firefighters during a brief speech. The 71-year-old actor also slammed President Donald Trump for blaming the wildfire on poor forest management. He told firefighters, "you are tough to not only fight the fires, but you are tough to listen to all this crap." Authorities trying to identify people killed are using rapid DNA testing that provides results in just two hours. The system can analyze DNA from bone fragments or other remains, then match it to genetic material provided by relatives of the missing. The technology depends on people coming forward to give a DNA sample via a cheek swab. But as of Tuesday, nearly two weeks after the start of the inferno, only about 60 people had provided samples to pop-up labs, said Annette Mattern, a spokeswoman for ANDE, a Colorado company that is donating use of the technology. "We need hundreds," Mattern said. "We need a big enough sample for us to make a positive ID on these and to also give a better idea of how many losses there actually are." Officials said nearly 870 people were still unaccounted for. The National Weather Service issued a flash flood watch for Paradise and nearby communities and for those areas charred by wildfires earlier this year in Lake, Shasta, Trinity and Mendocino counties. The Camp Fire, which has burned an area about the size of Chicago — nearly 240 square miles — was 80 percent contained. 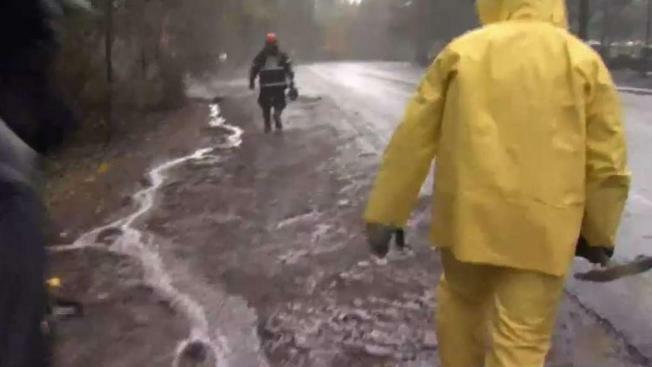 In Southern California, people who worried days earlier that their homes might be consumed by flames were taking precautions against possible mudslides caused by the approaching storm. Residents filling sandbags at Malibu's Zuma Beach were mindful of a disaster that struck less than a year ago when a downpour on a fresh burn scar sent home-smashing debris flows through Montecito, killing 21 people and leaving two missing. The 151-square-mile Woolsey Fire in the Los Angeles area was almost entirely contained after three people were killed, 1,643 structures destroyed and 364 damaged. Associated Press journalists Olga R. Rodriguez, Christopher Weber and John Antczak contributed to this report.